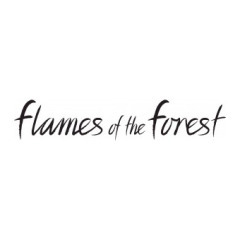 Flames of the Forest is Australia's ultimate rainforest venue, offering two unique dining experiences. Located ten minutes from Port Douglas and fifty minutes from Cairns, it is a world away from the everyday, set in a private rainforest clearing. 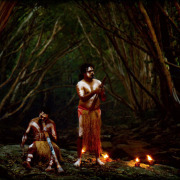 The Aboriginal Cultural Experience takes place on Tuesday and Thursday evenings, where you'll learn about Australia's ancient culture in a timeless, spiritual setting. Feast on a magnificent seven dish plattered banquet served to shared tables of ten and a selection of Australian wines. 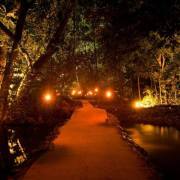 The Rainforest Dining Experience for two provides a unique alternative to a traditional Port Douglas restaurant. This exclusive, intimate, romantic dining experience takes place Saturday evenings. Perfect for honeymooners, marriage proposals, small wedding receptions, anniversaries, celebration dinners or for those looking for a special gift to give someone. 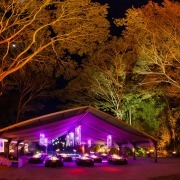 Flames of the Forest is award winning venue and North Queensland's ultimate rainforest ballroom!